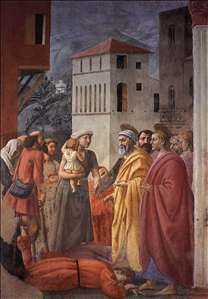 Masaccio (1401-1427? ), the first great painter of the Italian Renaissance, whose innovations in the use of scientific perspective inaugurated the modern era in painting. 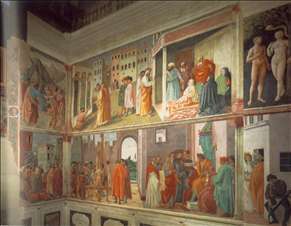 Masaccio, originally named Tommaso Cassai, was born in San Giovanni Valdarno, near Florence, on December 21, 1401. He joined the painters guild in Florence in 1422. His remarkably individual style owed little to other painters, except possibly the great 14th-century master Giotto. He was more strongly influenced by the architect Brunelleschi and the sculptor Donatello, both of whom were his contemporaries in Florence. From Brunelleschi he acquired a knowledge of mathematical proportion that was crucial to his revival of the principles of scientific perspective. From Donatello he imbibed a knowledge of classical art that led him away from the prevailing Gothic style. He inaugurated a new naturalistic approach to painting that was concerned less with details and ornamentation than with simplicity and unity, less with flat surfaces than with the illusion of three dimensionality. Together with Brunelleschi and Donatello, he was a founder of the Renaissance. 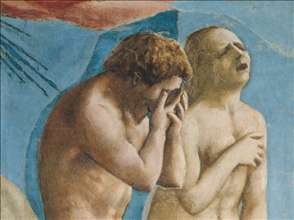 Only four unquestionably attributable works of Masaccio survive, although various other paintings have been attributed in whole or in part to him. 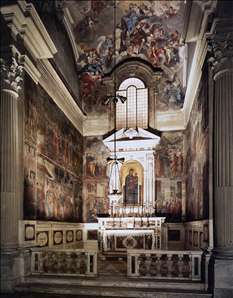 All of his works are religious in naturealtarpieces or church frescoes. The earliest, a panel, the Madonna with St. Anne (circa 1423, Uffizi, Florence), shows the influence of Donatello in its realistic flesh textures and solidly rounded forms. The fresco Trinity (c. 1425, Santa Maria Novella, Florence) used full perspective for the first time in Western art. His altarpiece for Santa Maria del Carmine, Pisa (1426), with its central panel of the Adoration of the Magi (now in the Staatliche Museen, Berlin), was a simple, unadorned version of a theme that was treated by other painters in a more decorative, ornamental manner. 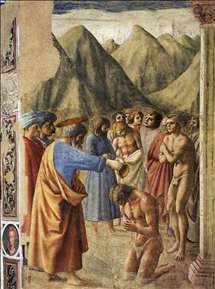 The fresco series for the Brancacci Chapel in Santa Maria del Carmine, Florence (about 1427) illustrates another of his great innovations, the use of light to define the human body and its draperies. 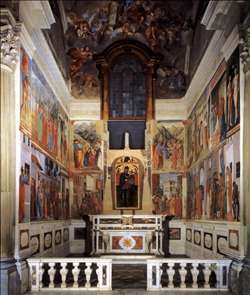 In these frescoes, rather than bathing his scenes in flat uniform light, he painted them as if they were illuminated from a single source of light (the actual chapel window), thus creating a play of light and shadow (chiaroscuro) that gave them a natural, realistic quality unknown in the art of his day. Of these six fresco scenes, Tribute Money and the Expulsion from Paradise are considered his masterpieces. 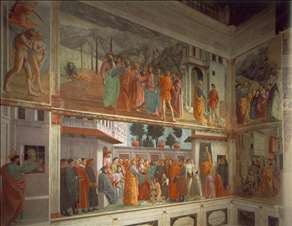 Masaccio s work exerted a strong influence on the course of later Florentine art and particularly on the work of Michelangelo. 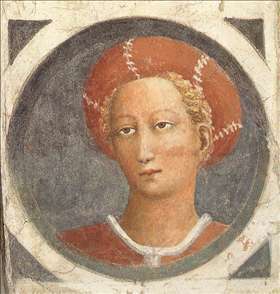 He died in Rome in 1427 or 1428. See more details about "View of the Cappella Brancacci (after restoration)"
See more details about "View of the Cappella Brancacci (before restoration)"
See more details about "Frescoes in the Cappella Brancacci (left view)"
See more details about "Frescoes in the Cappella Brancacci (right view)"
See more details about "The Expulsion from the Garden of Eden"
See more details about "The Expulsion from the Garden of Eden "
See more details about "The Baptism of the Neophytes"
See more details about "The Distribution of Alms and the Death of Ananias"